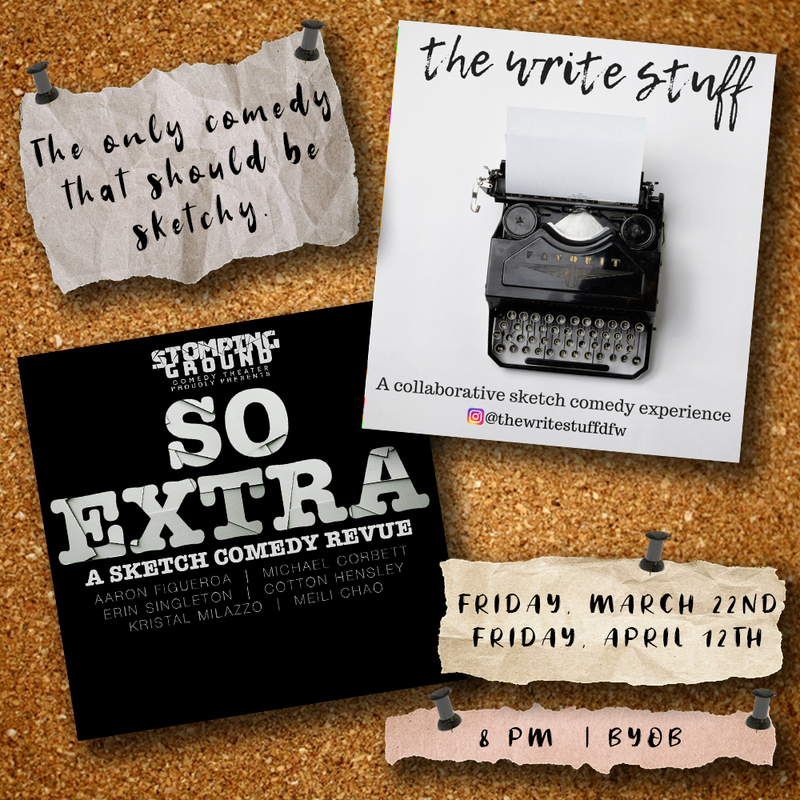 So Extra is Stomping Ground's sketch comedy revue comprised of pieces snatched from the cutting room floor and brought back to the stage to dazzle audiences. From Alexa to Kon Mari Method, this revue explores our current absurd reality through songs and scenes. Written by Michael Corbett, Aaron Figueroa, Erin Singleton, Kristal Milazzo, and Meili Chao and performed by Rashid Eldoma, Javoris James, Collin Brown, Kat Lozano, Jessica Roth, and Katie Dallas. This show is rated M for Mature/18+. Stomping Ground is BYOB. Seating beings 15 minutes prior to the start of the show. 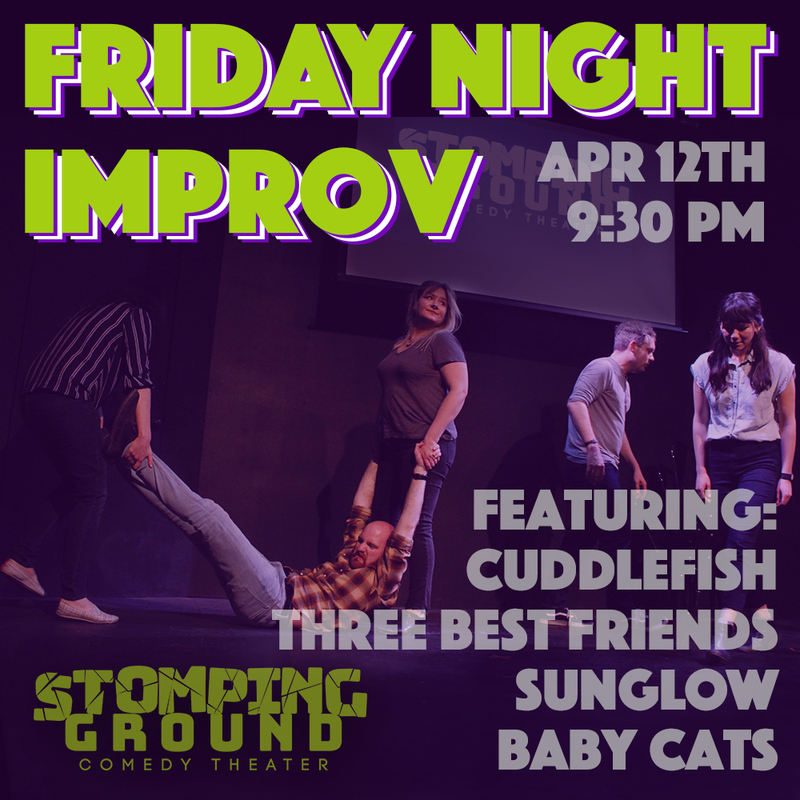 Live long form Improv Comedy brought to you by Cuddlefish, Three Best Friends, Warm Milk, & Baby Cats.You’ll be seeing triple as Stomping Ground House Team Cuddlefish shows you three iterations of the same scene and then takes you on a wild ride inspired by this threepeat. Three Best Friends flawlessly weave stories and characters in a way that lets you know they're definitely connected on a cosmic level. Sunglow joins Friday Night Improv to shine light upon the SG stage with their cosmic scenework. Stomping Ground's House Team Baby Cats' organic scenes are relatable and grounded, giving the audience those warm, fuzzy feelings you get when you spend time with your favorite furry friends.This show is recommended for ages 18+. Stomping Ground is BYOB. Seating begins 15 minutes prior to the start of the show.